A system stirred up by a low pressure tracking out of Mexico into the Gulf of Mexico this week is on track to bring unsettled conditions for part of the weekend to the UK. It’s nothing too severe for most but is an interesting feature that will bring some wind and rain everywhere. Below is a satpic showing the development of this system as it interacted with a lively jetstreak on Saturday 28/02/2015. This LOW illustrates nicely how extra-tropical systems can rattle clean across the Atlantic in a few days if they are picked up by an active jetstream. This one does precisely that. Spot the system leaving Florida on the chart below for today and the sat pic. This system started as a low pressure crossing from Mexico into the Gulf of Mexico mid-week, so for weather systems it will be an aged fellow on arrival here in the UK. Its’ longevity is partly due to the exceptional COLD over NE US which interacts with the warm tropical air and causes further deepening. The Gulf low pressure is tracking quickly NE skirting the US east coast before being picked up and deepened further by an active jetstream. 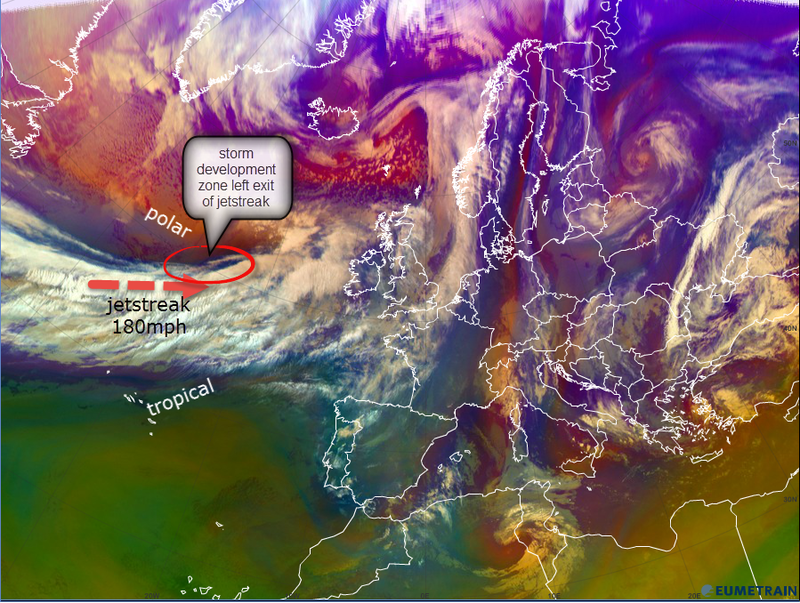 The jetstream itself is particularly powerful at the moment due to intense cold spilling out of an exceptionally wintry NE USA meeting warm tropical air issuing from a strong subtropical Azores HIGH pressure converging with the moist Gulf airmass. A result of the powerful jetstream is a positive North Atlantic Oscillation: the NAO is a measure that indicates the difference in pressure between Iceland and the Azores. In positive NAO conditions the jetstream is often active, producing a strong westerly zonal flow keeping Europe mild and unsettled especially in winter, or early spring! Our Gulf LOW is due to pass over Reigate fairly rapidly through Saturday pm and overnight into Sunday am and bring some moderately wet and windy weather, likely to go unnoticed because of the nocturnal transit. 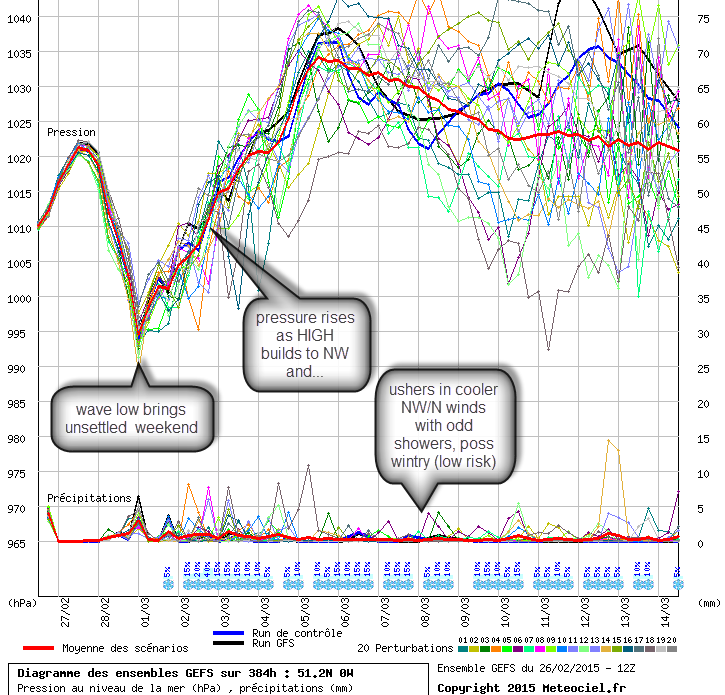 Winds gusting in excess of 40mph are possible for Reigate into Sunday am in exposed places. Notably, due to the TROPICAL origins of this airmass the temperature overnight Sat-Sun could climb to double figures in Reigate. Tropical air crossing the Atlantic also picks up a tremendous amount of moisture so attendant fronts are likely to bring a lot of rain too, possibly exceeding 10mm overnight, which is a moderately wet night. 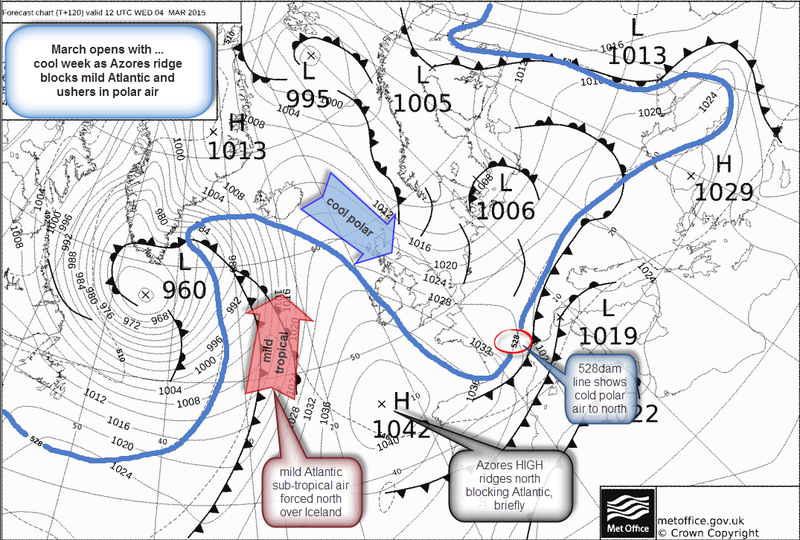 Here are the synoptic charts showing the Gulf low progress across the Atlantic, deepening and occluding into the North Sea. Note the secondary wave which could bring additional rain later on Sunday to the South. 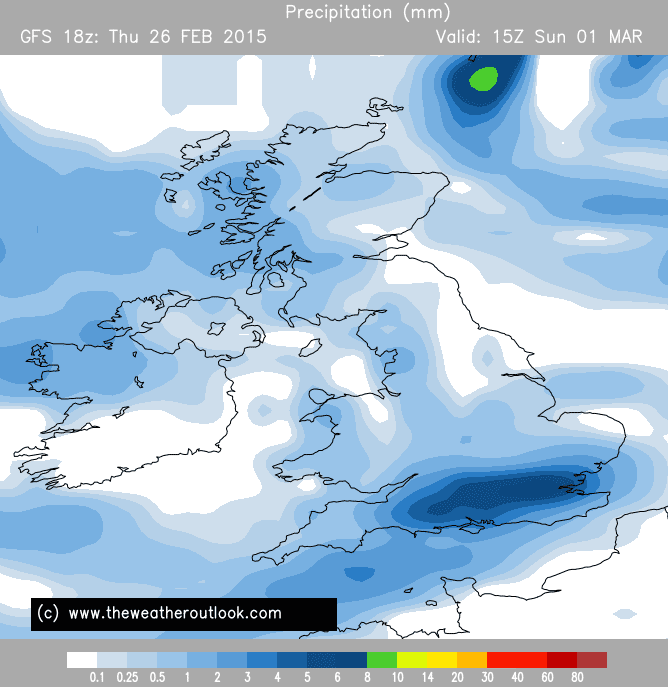 The additional rain later Sunday afternoon / evening looks potentially heavy for the South and SE. It’s a rapidly developing wave feature that needs attention as, on the northern edge, it looks to raise the possibility of snow across the Midlands. Heavy rain is possible for the SE and #Reigate with a period of gales on the south coast. The outlook for next week is for the Azores HIGH pressure to extend a ridge to the north and cause a NW then northerly airflow for the UK. 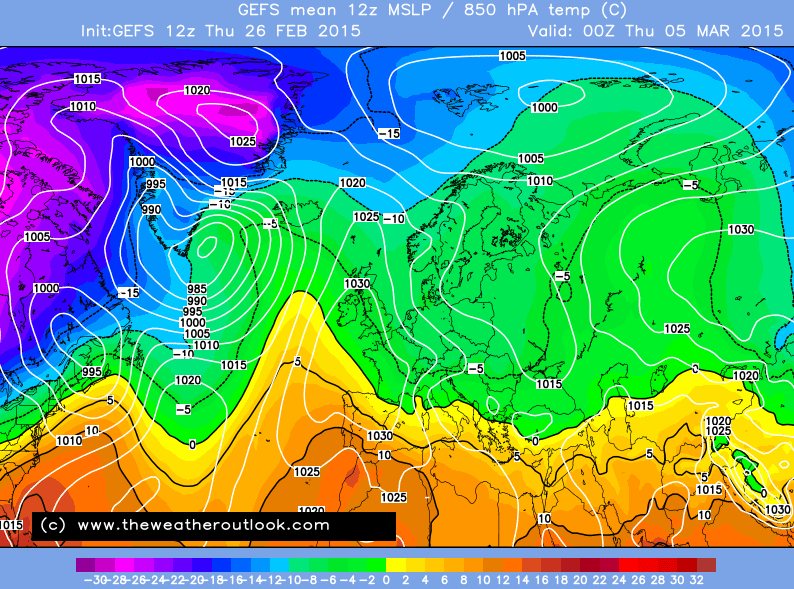 This will bring cooler temperatures to the UK. Whilst it is likely to be mostly dry for Reigate and the SE with pressure rising, wintry showers especially on east facing coasts of the North Sea could be possible depending on how the HIGH develops. Frost is likely with temperatures dipping below freezing at night from mid-week. How long this Atlantic block persists, and the cooler weather, is uncertain. The coldest scenario would depend on the HIGH moving north and east and building over Scandinavia to pull in easterlies from a cold continent. This scenario is preferred by the ECM by later next week whilst the GEFS topples the high to the SE and brings back a zonal mild westerly flow from the persistent Icelandic LOW pressure that erodes the edges of the HIGH from the NW. The charts below show the uncertainty as a wide spread of possible pressure and temperature towards the end of the first week in March. First week of March starts cool: MetOffice synoptic chart for mid-week shows Azores high briefly ridging north to block mild zonal westerlies and usher in a cold polar airmass, albeit briefly as this ridge looks to topple SE and by next weekend we could be in a pretty mild SW flow hitting mid-teens possibly. So a cool, mostly dry middle part of the week for Reigate and much of S England but precipitation, some even wintry, pulling in on NW / N winds is not ruled out with a North Sea low possible. As the Atlantic is likely to push westerlies back in later in the week we can expect more purposeful frontal rain pushing east across the whole country.